Dubai, one of the seven emirates that make up the United Arab Emirates, often draws comparisons to Las Vegas due to its larger than life aesthetic appeal and fast-paced, feel-good nature. Of course you wont find any casinos here  its economy is largely built around its tourism industry, meaning no expense has been spared to ensure there are enough reasons for visitors to flock to the sprawling desert metropolis. Home to many worlds largest, worlds fastest and worlds most expensive attractions, Dubai has something to suit literally every kind of travel itinerary. If you only have one day to shop in Dubai, make it count. 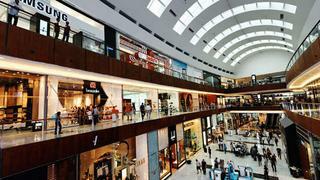 Head to the Dubai Mall, currently the largest shopping mall in the world with more than 1,200 retail outlets. Take advantage of some Arabian hospitality by booking a personal shopper at one of the malls luxury department stores, including Galeries Lafayette and Bloomingdales, or peruse the endless designer boutiques. If you love shoes, dont miss the new Level Shoe District, with row upon row of shoes from 250 designers, all under one roof. Take a break from your retail therapy and wander past the Dubai Aquarium and Underwater Zoo, where you can watch scuba divers swim with the sharks (book the Sharwalker experience if youd like to try it yourself), and visit the worlds largest gold souk, a labyrinth of glittering gold and diamond jewellery from 220 different retailers. After dusk, head outside to the Burj Khalifa Lake to watch the Dubai Fountain, with jets of water that reach up to 500 feet (150 metres), all swaying and bending in perfect synchronisation to Arabic, pop and Bollywood tunes ( [www.thedubaimall.com](www.thedubaimall.com)). For a more relaxing vantage point, view the fountains from one of the restaurants in the Souk Al Bahar, or from the outdoor terrace of Calabar at the Address Hotel Downtown Dubai ( www.theaddress.com/en/hotel/downtown-dubai). 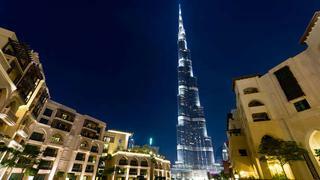 The Burj Khalifa, the tallest man-made structure in the world at 830 metres high, looms over Dubais skyline and is lit up by thousands of twinkling lights after dark. Escape the throngs of tourists that flock to the observation deck on the 124th floor and enjoy the views at your leisure by booking lunch or dinner at the elegant At.mosphere restaurant, just two levels below the main observation deck. Awarded the Guinness World Record for Highest Restaurant from Ground Level, at a height of 442 metres, At.mosphere serves a surprisingly sophisticated and well-executed menu. Alternatively you can opt for drinks at At.mospheres separate lounge and bar next-door. Reservations are necessary ( www.atmosphereburjkhalifa.com). Whether you are a serious golfer or you just want to enjoy a leisurely day on the green, the UAE offers a favourable climate, experienced yet inexpensive caddies and expertly manicured courses. If you have time for just a few rounds, why not tee off where the pros do and book 18 holes at Emirates Golf Club ( www.dubaigolf.com/emirates-golf-club.aspx), home of the European Tour sanctioned Omega Dubai Desert Classic, or Jumeirah Golf Estates, featuring the championship Fire and Earth courses, designed by golf legend Greg Norman ( http://www.jumeirahgolfestates.com). Other championship courses include the Dubai Creek Golf & Yacht Club, overlooking the Dubai Creek and Marina ( www.dubaigolf.com/dubai-creek-golf-yacht-club.aspx), and the Els Club, designed by pro golfer Ernie Els ( www.elsclubdubai.com). 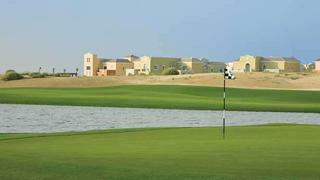 Many of the touring pros also make time for the Yas Links course in Abu Dhabi, widely renowned for its challenging courses and beautiful setting ( www.yaslinks.com). Cool off from the desert heat at one of Dubai's famous waterparks. The oldest (and most family-friendly) is Wild Wadi, at the Jumeirah Beach Hotel, which lures guests with its array of slides, lazy rivers and views overlooking the iconic Burj Al Arab ( www.jumeirah.com/en/hotels-resorts/dubai/wild-wadi/). 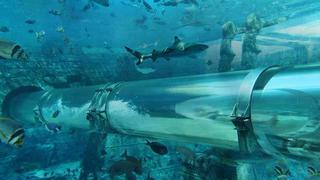 Those who prefer a slightly more adult experience can visit Aquaventure Waterpark at the Atlantis Hotel on The Palm, where you can try the Ziggurat, a nine-storey drop slide that shoots riders through an acrylic tube surrounded by sharks and stingrays ( www.atlantisthepalm.com/marineandwaterpark/aquaventure.aspx). Water-sports enthusiasts can head to the brand-new Wadi Adventure park in Al Ain (roughly 1.5 hours drive from Dubai), offering man-made white-water rafting, surfing, and kayaking facilities, a waterpark, and zip-lining and obstacle courses ( www.wadiadventure.ae). Most of the five-star beach hotels in Dubai have their own impressive private beaches, but a crop of Ibiza-inspired beach clubs have begun to pop up along UAE shorelines. For a chilled-out experience in the heart of the cosmopolitan Dubai Marina, spend a day on a chaise lounge at Meydan Beach Club, which offers international DJ sets at its outdoor bar, and famed Milanese restaurant Giannino ( www.meydanbeach.com). 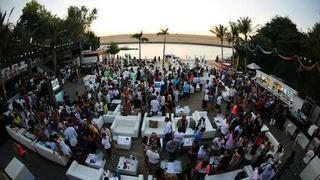 Those seeking a more upbeat party vibe can venture to Blue Marlin, especially popular on weekends for its exclusive parties and DJ sets ( www.bluemarlinibiza-uae.com). Families and a slightly more sophisticated crowd tend to favour the azure blue waters and powder-fine sands of the Monte Carlo Beach Club, on Saadiyat Island in Abu Dhabi ( www.montecarlobeachclub.ae). There are plenty of tour operators offering the ubiquitous desert safaris (usually a combination of dune bashing in a 4×4, plus camel trekking and a buffet meal), but discerning travellers who would like a more authentic experience can try glamping (glamorous camping). 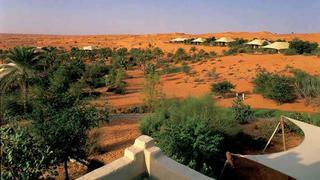 Bedouin Oasis is a peaceful tented camp tucked away amongst the red dunes of the Ras Al Khaimah desert. You can book either an overnight experience just for two, or for a group; tents, towels, and toothbrushes are provided, and there are proper toilets and sinks, located inside candle-lit canvas tents. Sit in the camps mood-lit majlis-style main tents and enjoy drinks from the bar while you sample Arabic mezze and lamb (prepared the traditional Bedouin way, slow-roasted in an underground fire pit). Activities such as camel trekking and dune driving can also be arranged, as well as pick-up and drop-off ( www.arabianincentive.com). Those who would prefer a desert experience with all the comforts of a luxury five-star hotel can book into Al Maha Desert Resort, part of Starwoods Luxury Collection, where guests stay in Bedouin-style suites scattered throughout the Dubai Desert Conservation Reserve ( www.al-maha.com/). Dubais polo scene has been gaining worldwide recognition over the past few years, and is now home to illustrious events including the Cartier Polo Dubai, held at Per Aquums Desert Palm polo estate ( desertpalm.peraquum.com), and the Coutts Polo at the Palace, held at the expansive gardens of the Emirates Palace Hotel in Abu Dhabi ( www.kempinski.com/en/abudhabi/). If there are no major polo events going on during your visit, you can check the Dubai Polo and Equestrian Club, which offers weekly matches and events during Dubai's polo season, from November to April ( www.poloclubdubai.com). Dubais roads can be frustrating to navigate due to its lack of a proper grid system, and taxis are not particularly well maintained. For a completely relaxing holiday experience, consider hiring a chauffeured vehicle during your stay. 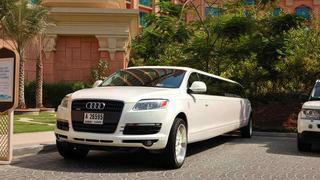 You can book a private car through your hotel, or from a car-hiring service such as On-Call Limousines, which provides experienced drivers and a fleet of luxury vehicles including Rolls Royce Phantoms, BMWs and Lincoln Navigators, equipped with complimentary WiFi, bottled water, maps, and newspapers ( www.oncall-limo.com; +971 4 425 9399).